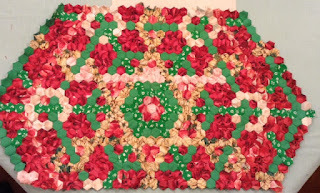 My love affair with the Xmas quilt started in 2008 when I purchased Jackie Willis’ book after watching a video on You Tube. I wrote a post about the quilt in here and here in 2012 and in 2014 here. 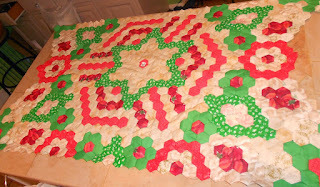 Unfortunately, I did not take a picture of the quilt in 2013 before it disappeared. Suffice to say it was three times the size of the November 2014 photo. I started a new quilt in 2014 and the disappointment of not knowing what happened to the first quilt was too much so, I put it away. 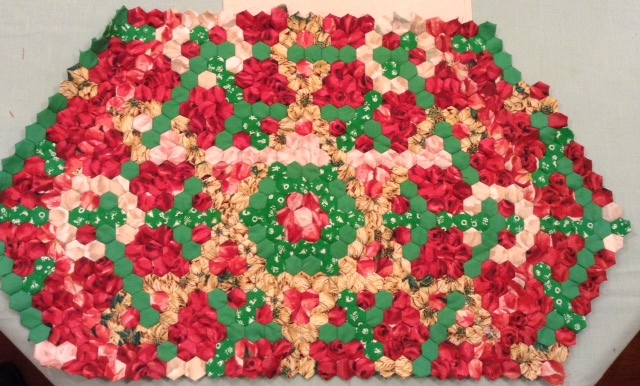 Then, suddenly last month my interest in the quilt was renewed and I started working on the quilt again. I am enjoying working on the quilt. My goal is to complete before the Xmas holidays. I am working slowly and steadily.